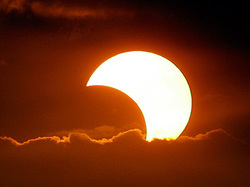 Perhaps the most spectacular astronomical event we can observe are lunar and solar eclipses! They used to be considered omens of great fortune or complete disaster in ancient times! We now know that eclipses occure because of the orbits of the Earth and Moon with respect to the Sun. Today you will explore Solar and Lunar Eclipses using the internet and answer questions about this amazing sight! Click on the Picture to Play with the Earth and Moon to discover how Eclipses Work. When and Where is the next Eclipse? Visit NASA’s Eclipse site: http://eclipse.gsfc.nasa.gov/eclipse.html to find out if and when there will be an eclipse this year and how often they occur. How do we view an eclipse? Does everyone get to see it? When will it rise? Is it dangerous? When is the next eclipse? What type is it?